The Carolina Panthers signed former Mississippi State wide receiver Fred Ross to a contract as an undrafted free agent. Ross’ junior year was his finest playing with Dak Prescott, and his numbers dropped this past season with Nick Fitzgerald. 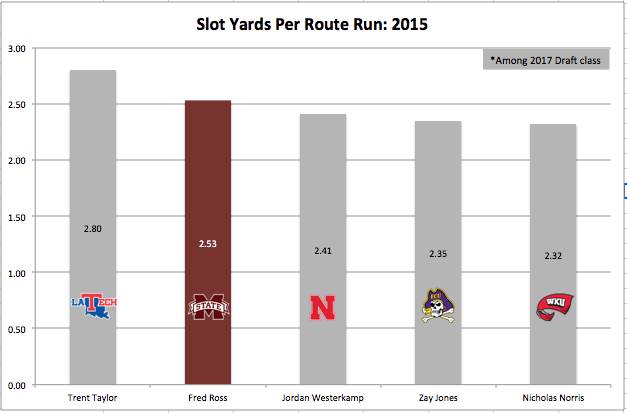 Ross’ receiving grades of 75.3 in 2016 and 78.0 in 2015 both ranked in the top 10 among SEC receivers. 2015 was Ross’ most efficient season. He posted a catch rate of 73.9 percent and earned 7.9 yards after the catch per completion.